Tonight, I’m showcasing Snow Globe Die-namics. This adorable set has so many possibilities! My card here uses all the pieces from Snow Globe Die-namics and then I added a smallest Pierced Traditional Tag STAX Die-namics and stamped the JOY from a sentiment in Ornament Banner Builder. I cut out the snow globe top in Sno Cone Card Stock and then layered one of the Tree Lines Die-namics in both Smooth White and Timber Green Card Stock. I cut out the snow man in Smooth White Card Stock, with a Black Licorice hat and Electric Red scarf. This guy was so much fun to put together! The snowflakes are the punch-outs from the new Falling Snowflakes Die-namics die. This is beyond adorable, Karen!! That snowman is sooo cute and love the tag hanging from his twig arm. Karen, love the 3D effect of your snow globe. The tag is adorable. 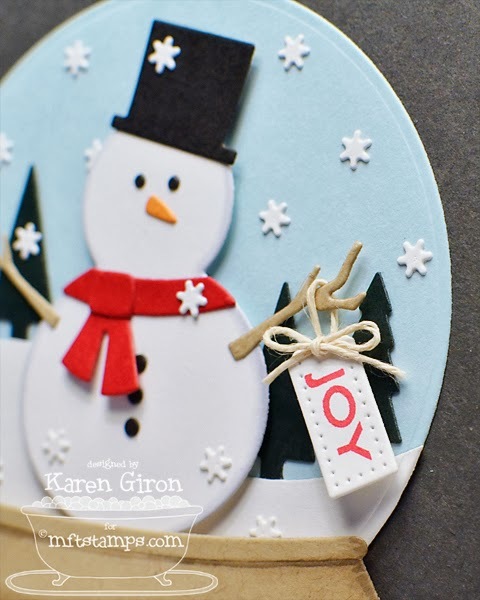 I am in love with this little snownam!Beautiful card. Love love love this! The snowglobe is awesome!! ADORABLE - great job. I love snow globes! Oh the details, those tiny little details that take this card over the top! Love it!!!! This is so cute! Love your attention to details! My favorite card so far...love the cute scene you created and I know I will have a blast coming up with scenes for every occasion or holiday! oh my - how sweet! Absolutely ADORBS! Love that snowman holding a little greeting! So sweet! Have a great weekend! Hugs! So adorable Karen! Love how you added dimension to the snowglobe and such a sweet wintery scene! Oh I LOVE this! Great shading on the snowman, and such cute snowflakes. And wow, the snow globe base looks so real! Like I could just pick the whole thing up and shake it to see the snow fall. :) Thanks for sharing! I love this card and the adorable snow globe on it !! ACK! This is adorable! Love how he;s holding that little tag in his twiggy hand! 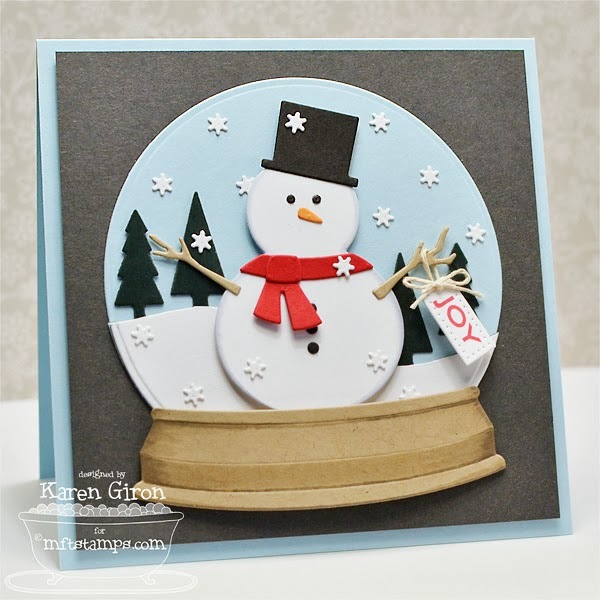 Great card...love snowmen and snow globes...thank you for sharing! Wow that base looks real, I love how you did that. This snow globe is so darn cute! And I love the snowman pieces! Great card! So, So, So CUTE! Love the snowflakes over all. This is fabulous, Karen! The coloring on the base REALLY gives it dimension! This Card is Snow Beautiful. Great Job!